Is College Football a Cash Cow or a White Elephant? FRONT ROYAL, VA — Fifty years ago, Father Ted Hesburgh, President of Notre Dame, launched a campaign to make the school measure up to "Ivy League" academic standards. Alas, students did not jump for joy. They did not appreciate the underlying notion that they were being educated at a Catholic intellectual backwater in need of a makeover. Rah Rah for "Academic Excellence," we got "Academic Excellence,"
We got "Academic Excellence" round here. I was the banjo player. Little did we know how prophetic we were. Notre Dame has just announced a $400 million project to expand the football stadium, create thousands of premium seats for high-dollar donors, and replace the natural grass field with artificial turf. Notre Dame has just announced a $400 million project to expand the football stadium, create thousands of premium seats for high-dollar donors, and replace the natural grass field with artificial turf. The stadium will be connected on three sides with new buildings that are "academic" on the outside with skyboxes on the side that faces the playing field. Yes, we Mountain Williams were prophets, but we had it backwards: Now it's "Rah Rah for Irish Football — and cash." But that's really kind of crass, isn't it? Well yes, it is. 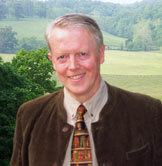 Philosopher Ralph McInerny, one of the most respected faculty members in Notre Dame's history, called this penchant for prestige a "vulgar lust." That stings. So Father John Jenkins, C.S.C., Notre Dame's current president – most famous for his slavishly fawning embrace of Barack Obama on campus four years ago – is selling this latest version of the Tower of Babel as a "bold" vision that's about as academic as Obama's honorary law degree. 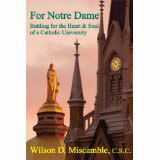 Enter Father Wilson Miscamble, C.S.C., former chairman of Notre Dame's history department and author of For Notre Dame: Battling for the Heart and Soul of a University (254 pages, St. Augustine's Press, 2013). Fr. Miscamble is fully engaged in the campus conversation addressing Notre Dame's future. "This Project must be opposed forcefully," he writes in the Irish Rover, a campus newspaper. "It damages the true mission of the university. It is a grossly wasteful expenditure of money that reveals in telling fashion the misplaced priorities of the Jenkins administration. Furthermore, the building mania it manifests gives the illusion of movement and progress at the university while distracting from Notre Dame's essential mission." That mission is "Catholic," not "Cash." "Notre Dame's Director of Athletics, Jack Swarbrick, has argued that the three enormous buildings bolted on to the football stadium offer evidence of the 'integration of athletics into the academic mission of the university.'" Perhaps the NCAA should face reality and tell colleges to hire football players like they hire other staff. Let them unionize, pay them, and stop pretending they're going to class. "What the Project instead reveals is the subjection of the academic mission of the university to the needs of the all-powerful axis of athletics and development. It represents a definite retreat from the Hesburgh vision of keeping our fabled football program in an important but supportive role at the university. It clearly demonstrates that the tail of the athletics juggernaut wags the supine dog of the academic enterprise of the university." "Eliminate the luxury seating, and there is no way that Notre Dame would pursue such an ill-considered scheme." Father Jenkins is undoubtedly undaunted. After all, Obama's entourage had scarcely departed four years ago when the university got a $30 million government grant for something-or-other, ironically coming from federal "Stimulus" funds. Apparently, Obama's visit had helped Notre Dame reach what the South Bend Tribune called a fundraising "milestone." The word spread quickly among coaches, according to the Chronicle of Higher Education. Top athletes nationwide get easy academic credit for two-week online "courses" available from obscure but accredited colleges like Western Oklahoma State Community College. Such bogus courses plague high-end programs too. At the University of North Carolina, a "final paper" comprising a single paragraph written with faulty grammar at the middle-school level was all that was required for one athlete to garner three college credits at the prestigious university. At least he went to one class. UNC Chancellor Carol Folt admits that some 200 African and Afro-American Studies courses in recent years, heavily "attended" by athletes, were either barely taught, or not taught at all. Northwestern University has a different problem. Left-wing university administrators there are aghast because their "amateur" athletes want to unionize and affiliate with the United Steelworkers. Suggested slogan: "From the Steelworkers to the Steelers." ...college football wouldn't last five years beyond the day that the first huge jury verdict in a concussion lawsuit impoverishes a typical public high school district. Admittedly, today's fiercely competitive admissions departments are forced to emphasize the college "experience"; education just doesn't seem to cut it any more. However, enjoying the "experience" can get out of hand. At both Notre Dame and Florida, two top football players in recent years have been accused of sexual assault (both have denied the charges). The University of Georgia seems to acknowledge the problem. According to CBS News in Atlanta, the Bulldogs' athletic guidelines suggest that players avoid "orgies" as well as noticeable sexual "passion marks" on their bodies. Notre Dame wants football to be an even more integral part of the college "experience." Is that prudent? It might not be. Some other considerations are quite daunting. Outstanding student college debt in America now totals over a trillion dollars, even as graduates find jobs increasingly scarce, and employers are increasingly dismayed at the lack of serious preparation they find in many recent graduates. That "experience" is decidedly uninspiring. The charade of "student-athletes" should be confronted head-on. Such honesty might be refreshing, but honesty might not be enough. College football's future prospects are far from guaranteed. Legal experts tell the Rubble that college football wouldn't last five years beyond the day that the first huge jury verdict in a concussion lawsuit impoverishes a typical public high school district. "Insurance companies won't even bother to raise their rates," they say, "they'll take a hike. And those free feeder programs at thousands of the nation's high schools that the college football system relies on will dry up." Legal issues regarding concussions have already cost the NFL over a billion dollars. How many school districts can afford that kind of money? The Bottom Line, Or the End of the Line? Father Miscamble writes that Notre Dame could build all the academic buildings included in the proposed Project for a tenth of the cost — about $40 million. But Notre Dame's football program is a cash cow, and cash is a very important ingredient in the Notre Dame "experience" recipe. The $30 million windfall after Obama's visit was not its only financial "milestone." Tuition in 2014 is now 28 times what it cost in 1964 — and for many students, that burden will be a lifelong millstone. Those graduates won't be skybox material. In fact, Notre Dame's new boondoggle might turn out to be a millstone too. If football programs fade as jury awards rise, that field might become a study hall after all — the most expensive one ever built.